Centrally located, take a short one block walk to Playa Escambron (the only swimming beach in Old San Juan), Munoz Rivera Park or the Caribe Hilton. You can also walk or take a 3 minute bus ride to the center of Old San Juan. This top floor 1 bedroom condominium was recently completely rebuilt. New electrical and plumbing, coral stone floors, kitchen and bath. Air-conditioning thru out, modern furniture and 40'' flat screen TV with premium programming and DVD player. The apartment comes completely outfitted with bed linen, towels and a complete kitchen. Don't miss your 400 square foot rooftop terrace, with views of the Atlantic Ocean or watch the cruise ships as they enter and leave the Bay. A beautiful peaceful setting where you can enjoy your next visit to San Juan. ALSO VIEW OUR 1ST AND 2ND FLOOR 2 BEDROOM LISTINGS #381793 AND #3910593. Please visit our website to view all of our apartments and find additional information about our property. This condo was a great choice and so was the location. Though smaller than we're used to, it was very adequate and comfortable with a minimalist touch. A/C was great and Internet service was great (which was why we left a previous location) and good selection of cable TV channels as well. Two things I would recommend be changed/fixed: 1) the front door lock does not work even though they said there was a trick to it. 2) I would definitely include more than 2 towels for stays of 2 days or longer. Overall, I would definitely recommend! Owner was very attentive and helpful. Would stay there again. The place is very well located, everything is as described, will come again! Clean and had evrerything we needed. We enjoyed our stay here, it is what we expected. The apartment was clean, and matched the pictures pretty close (there are actually two apartments that have the same but reversed floor plan). Martin was great! Very helpful! Let us know 100% if there was anything we needed to let him know! -Parking on the street was easy. Never full! -We had no couch issues that people mentioned before, it was comfy and clean just like the rest of the apartment! -Not really walking distance to Old San Juan, but we had a rental car so it was not bad. Parking in Old San Juan is $4 in a parking garage near Racies (great recommendation from Martin) and $2 if you park at the garage by the fort! -Location is not in a touristy area which is good and bad. Anywhere you want to go for the most part you need to drive. I am from Texas, if its not 100ft away we drive anyways so it worked for me. -Bed in the bedroom, was very lumpy and uncomfortable. Just seemed really cheap. I wont miss that bed! -The 3 Artwork pieces in the bedroom which can be seen in a picture was odd....kinda weirded out my wife! Overall we are very pleased with our stay! Thanks for your feedback. We have replaced the mattress with a new one and are looking forward to your next visit. This apartment is adorable and perfect for a couple. 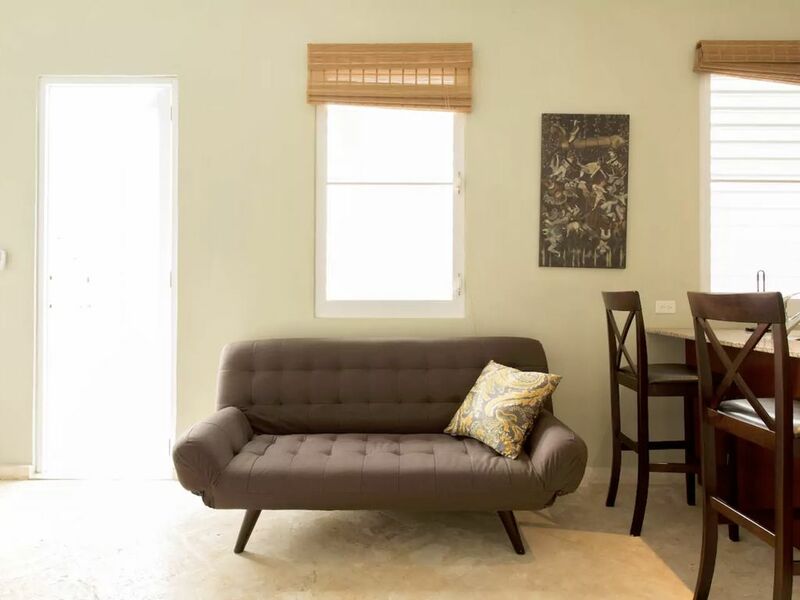 It is conveniently located about halfway between Old San Juan and Condado. Free parking on the street was never a problem. The apartment was clean and well stocked with basic kitchen supplies. We would absolutely stay there again! Centrally located, take a short one block walk to Playa Escambron (the only swimming beach in Old San Juan), Munoz Rivera Park or the Caribe Hilton. You can also walk or take a 3 minute bus ride to the center of Old San Juan. This top floor 1 bedroom condominium was recently completely rebuilt. New electrical and plumbing, coral stone floors, kitchen and bath. Everything is new including the air-conditioning, brand new modern furniture and 40' flat screen TV with premium programming and DVD player.